Reducing trade costs is essential for economies to effectively use trade as an engine of growth and sustainable development. Trade facilitation plays a pivotal role in reducing trade costs, on top of existing efforts to dismantle tariff and non-tariff barriers and enhance physical connectivity. In the Asia-Pacific Trade and Investment Report 2017, the United Nations Economic and Social Commission for Asia and the Pacific found that moderate region-wide improvements in trade facilitation in Asia-Pacific could lift GDP by 0.32% annually between 2015 and 2030, which is equivalent to nearly $87 billion per year – 14 times more than under the tariff liberalization scenario considered in the same study. Trade facilitation and the digitalization of trade procedures have taken increasing importance as evidenced by the WTO Trade Facilitation Agreement (TFA), as well as the growing number of regional and sub-regional initiatives for facilitating the electronic exchange of information along international supply chains, including the Framework Agreement on Facilitation of Cross-border Paperless Trade in Asia and the Pacific (FA-CPT). 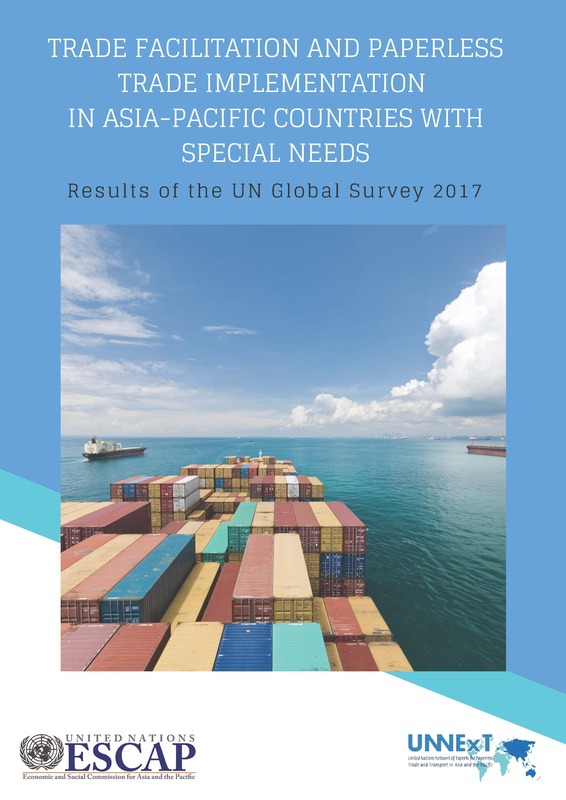 •	The average trade facilitation implementation in CSNs was generally low, with LLDCs at 43 per cent, LDCs at 34 per cent, and SIDS at 29 per cent, which were all significantly below the Asia-Pacific average of 50 per cent. Among CSNs, Azerbaijan had the highest implementation rate, exceeding 70 per cent; and Nauru had the lowest implementation rate, at 9 per cent. •	During 2015 and 2017, LLDCs have made better progress than LDCs and SIDS, especially on Transparency and Formalities measures. LDCs and SIDS need to build up the momentum to implement trade facilitation measures across the board to tap the potential of trade as an engine of sustainable development. •	Comparing implementation based on different groups of measures, LLDCs have well implemented trade facilitation measures related to Transparency, while LDCs and SIDS had highest score on Institutional arrangement and cooperation. •	Among the seven Asian LLDCs who already ratified the WTO TFA, implementation of WTO TFA related measures remains limited, although higher than those in LDCs and SIDS. •	Implementation of “inclusive” trade facilitation measures to promote SME and agricultural trade remained low in CSNs, despite their importance for achieving the 2030 Sustainable Development Goals. Going forward, CSNs shall continue efforts on trade facilitation and digitalization of trade procedures. To do so, all are encouraged to actively participate in the Framework Agreement on Facilitation of Cross-Border Paperless Trade in Asia and the Pacific, to advance regional cross-border paperless trade through pilot projects, information sharing and coordinated adoption of international standards and implementation models.